If you want a family home with a stunning modern interior and a classic exterior, then you'll love the home we are about to explore today. It manages to look like it would fit perfectly in many residential communities, and yet the interior has an undeniable sense of abundance and modern luxury. The home has a minimalist facade with a peaked roof design. There is one large window placed on the upper level for privacy. The ground floor area also has a deep awning to help shield the windows from excess heat. Each element and material has been carefully considered to help the home retain heat during winter and keep cool during summer. 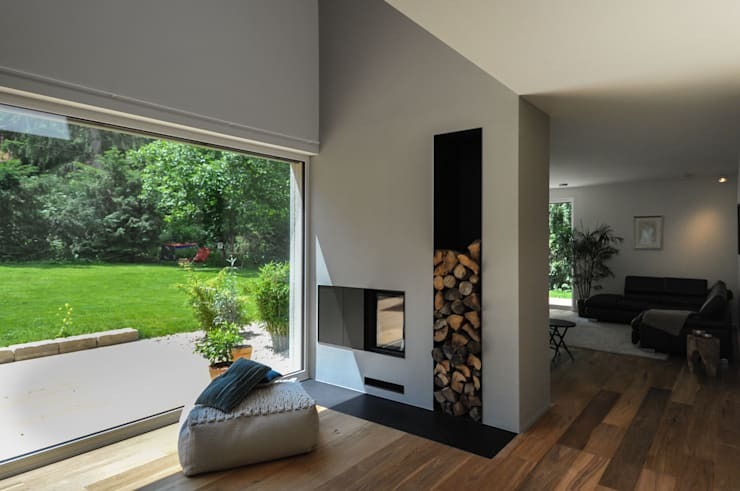 The living room has been designed with clean lines of sight and one big opening leading out to the garden. This helps the outdoor area feel like an extension of the living room during summer. The dividing wall between the living room and entrance also doubles as a fireplace and storage unit for the wood. The firewood storage area adds a strong decorative rustic look to the room. 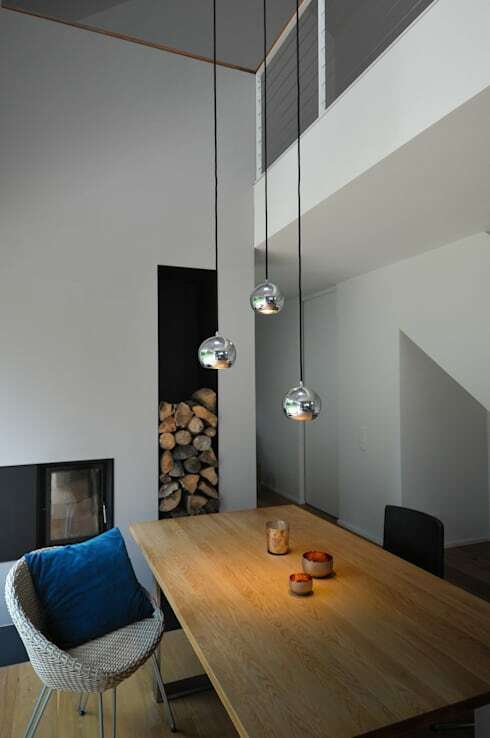 The double height of the living room has been emphasized by the addition of some long, low pendant lights. The black electrical wire draws the eye upwards and the chrome bulbs add to the visually lightweight modern look of the room. Note how the strong vertical design of the fireplace storage unit follows these same lines. This kind of wooden staircase design is particularly popular at the moment. The combination of white and wood is always successful and here, the wooden tread adds a homely, sturdy look. It also bridges the divide between a modern and a classic look too. 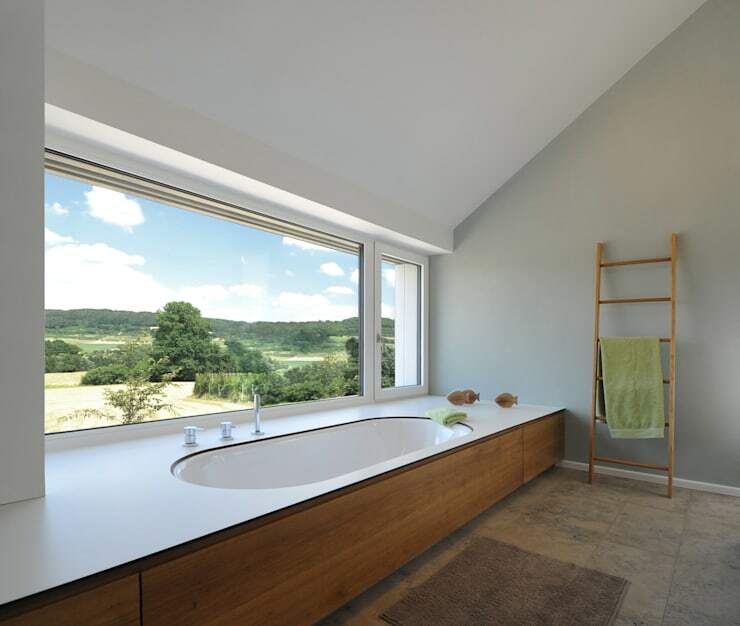 Bathtubs are places to relax and linger a while, so if you have a spectacular view like this it makes sense to use it! The wall is almost completely made from glass and the upper level vantage point makes it all the more private. Finally, note how the bathtub has been subset within a larger wooden shell. This definitely adds to the clean and streamlined look of the room. 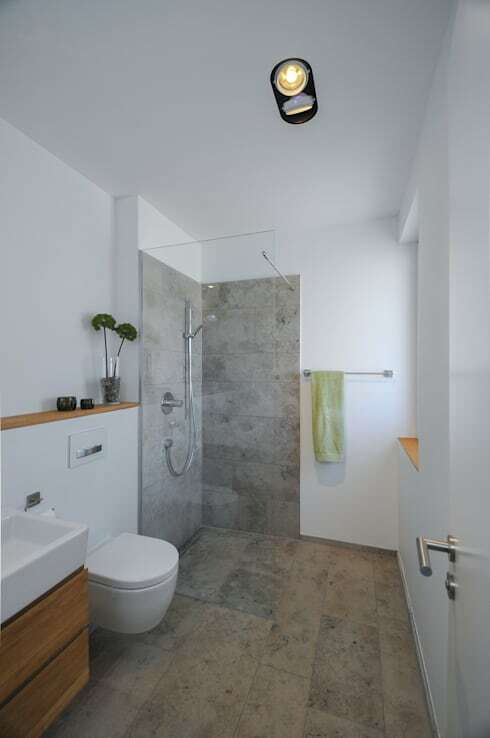 Shower rooms are great for making a bathroom feel spacious. They also really throw attention onto the wall tiles. This is particularly obvious in this modern shower room. It is the perfect big modern bathroom for a good solid famil home. 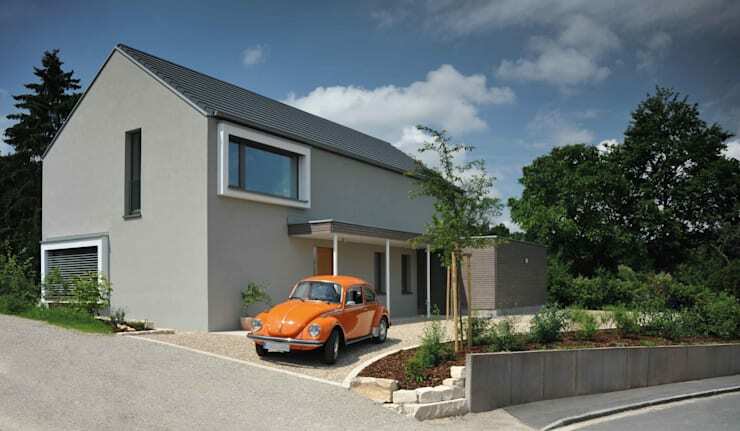 Dream a little more and have a look at The dream two-storey home for a busy modern family. What do you think of the contrast between the interior and exterior of this home?